The new Atomic FFG 12 High Performance skiboard release bindings are made for advanced to aggressive riders and built for high performance. 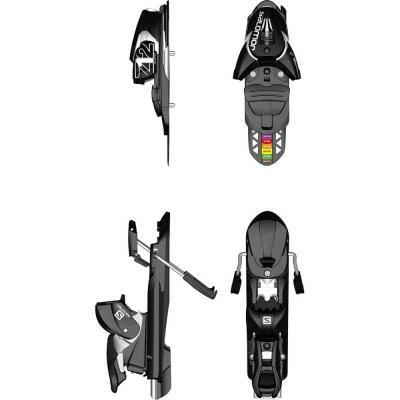 The new Atomic FFG 12 High Performance skiboard release bindings are made for advanced to aggressive riders. Built for high performance, these automatic release bindings come with a higher DIN range of 4-12. This binding is slightly oversized with longer wings for great lateral transmission, yet rides lower on the skiboard (height 16.5 mm). If you ride your skiboards hard, in moguls, parks or wherever, these are what you want. Boot size range is 260mm to 384mm (approx. 4-15 US). Easy to adjust by hand. Skier weight 94-264 lbs. NOTE: These are identical to the Salomon Z12 bindings except for the brand name. If you order these with skiboards we will do free mounting and include free wide brakes.